In case you are not sure about the meaning of some word, look at our Glossary. The main menu is the entry point of Orbis. Whereever you are in the application, after pushing the Android Back button several times you surely end up there. 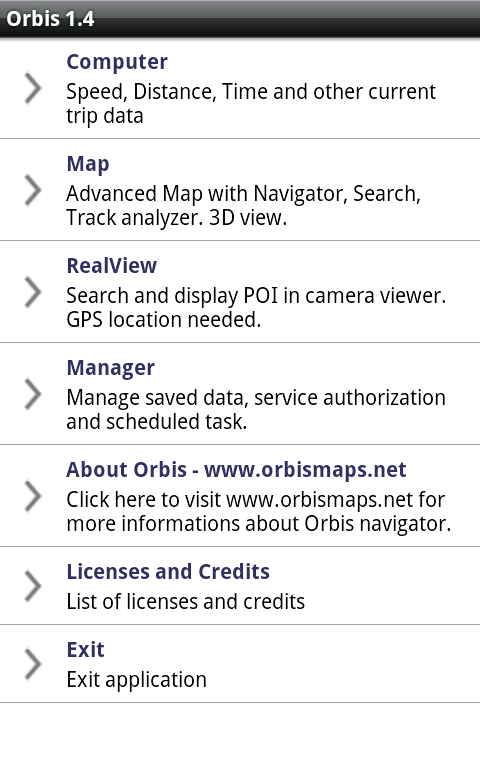 First, once you run Orbis, GPS connection is established (as long as you do not have it disabled). You should be aware of this fact especially when going abroad or running out of battery. Internet connection is established, if needed and possible (i. e. with map not having been cached and Internet connection enabled). Second, once you run Orbis, position logging starts. Hint: a brief description appears when you long press any button in the application (including menu items and functional buttons).